If you’re expecting a baby in April, congratulations! April is the first full month of spring and is a time of renewal and growth. Easter generally falls in April. Both the religious and secular celebrations of Easter symbolize new life. Baby chicks and bunnies are symbols of Easter and also make wonderful plush toys for your new baby! April is believed to take its name from the Latin word aperire, which means “to open.” April is the month when blossoms open and new leaves appear on barren trees. Colour and life return to the northern hemisphere as the southern hemisphere moves into autumn. It is also thought that the name may be a reference to Aphrodite and that the month may have been originally called “Aphrilis,” or “Apru,” after the goddess’s Etruscan name. Along with Easter, there are many other holidays in April, quite a few of them with religious significance to various traditions. These include Passover, Buddha’s Birthday, St. George’s Day, Good Friday, and St. Mark’s Eve. Other holidays that fall in April include April Fools’ Day, Earth Day and Arbor Day. April is National Poetry Month and National Poetry Writing Month. If you were an April baby, your birth flowers are the daisy and sweet pea which bloom in April, spattering the earth with color and adding their sweet scent to the air. Your birthstone is the diamond. The diamond is believed to be a great amplifier of the energies of other stones and of the wearer. You can use diamond to amplify the positive effects of aquamarine, emerald and amethyst, as well as your own energy. An April baby can be either an Aries (April 1st-19th) or a Taurus (April 20th-30th). Aries is a strong fire sign. Most Aries are curious, energetic, ambitious and restless. In approaching their goals they act with confidence and in their dealings with others they are direct. If you have an Aries baby, be ready to raise a bold and competitive child. Aries usually retain their competitive natures into adulthood and carry the force of their personalities into the workplace and their relationships. Famous Aries include Thomas Jefferson (April 13) and Leonardo Da Vinci (April 15). Taurus is an earth sign and generally a Taurus is a stable, grounded person who is conservative with decisions and makes a deeply loyal companion. Taurus is generally level headed even in intense situations but can be explosive if pushed over the brink. As a child, Taurus is usually pliable and reasonable but also can be intensely stubborn. They usually fit well into school and work situations, and thrive best in a stable environment which reflects their own inner natures. Some well known Taurus figures include Ulysses Grant (April 27) and Audrey Hepburn (May 4). Whether your April baby is a fiery Aries or a grounded Taurus, you are sure to find yourself with a strong willed and energetic child who will grow into a powerful adult. As the first full month of spring, April is an encouraging month to be born indeed! If you would like to welcome the April baby home with an adorable baby gift please visit our website Lil’ Baby Cakes and browse our selection. As a reader of our blog, you can save $10 using coupon code: APRBABY during checkout. Minimum purchase of $49. Offer valid for the month of April only. We are happy to introduce a line of personalized diaper cakes. These cakes allow you to add your own personalized greeting. This may be the baby’s name or other short phrase for welcoming the baby home. We will be introducing more selections in the future, however, in the meantime we have three selections for you to choose from. The first selection is called Kitty Cat Personalized Diaper Cake. 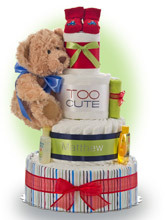 Your special message will be imprinted on the second tier of this four tier diaper cake as shown in the photo. Included in this cake is 72 Pampers Swaddler 1 diapers, the Johnson and Johnson Travel Pack of products, a Kitty Paci-Clip, and a pair of white eyelet trimmed socks. We also include a plush Kitty Cat toy adorned in pink, white, and mint stripes. your message appears on the second tier of the cake. This cake include 70 Pampers Swaddler 1 diapers, washcloths, newborn booties that have a cute little dump truck design on them, and a stripped flannel receiving blanket. Also included in the Johnson and Johnson products as well as a cute Gund Bear named Maxie. 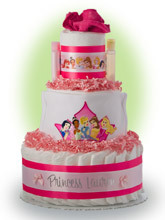 Our last selection is called Our Lil’ Princess Personalized 3 Tier Diaper Cake. This design has your message imprinted on the bottom layer as shown in the photo. Included in this design is 42 Pampers Swaddler 1 diapers, cotton Disney brand Princess bib, Johnson and Johnson products, and washcloths. Any selection you choose is wrapped in tulle ready for gift giving. We also provide an optional gift card you can add with any additional message. I’m really excited about the roll-out of these personalized cakes. Giving you the choice of adding your own special message is something we hope the new mom will enjoy. Also, in keeping with our goal of offering great value for your money, any of our personalized diaper cakes comes with FREE personalization. We hope you enjoy these selections. So far this year, we have introduced over 50 new designs. In thinking about these new designs, I wanted to cover a broad cross section of themes and colors so that you have the best selection possible. Should I Buy or Make a Baby Diaper Cake? Should You Buy or Make a Diaper Cake? I am often asked whether it is better to make a diaper cake yourself or purchase one ready made. Obviously I am a little bit biased because my core business is making baby diaper cakes. Nonetheless, I thought is would make sense to compare both options and then let the reader decide for themselves the best choice. There are many places to find information on how to make a diaper cake. You Tube has a slew of how to make a diaper cake videos, and you can also find diaper cake instructions through a Google search. It doesn’t matter where you find the information because regardless, you will be making one if not multiple trips to the store for supplies. So let’s start with the basics. You will need to find a cake plate to work with. Depending on the size of design you want to make, you may get stuck buying a package of cake plates because typically they are not sold individually. So unless you are making multiple diaper cakes for baby shower centerpieces, you won’t have much use for the remaining plates. Next comes the diapers. You can get these just about anywhere, however, based on the size of your design you will probably not use an entire box of diapers. I guess you can give the new mom the extra diapers you don’t use. It would be a bit awkward if you made a baby shower diaper cake and then tell the expectant mom “By the way, here are some extra diapers I didn’t use” along with your hand made diaper cake gift. Next comes the selection of the ribbon. You can select the ribbons and bows you would like to use from many different sources. There are literally hundreds of ribbon styles to choose from so the biggest problem will be picking one or multiple ones to use. Again, you will end up buying a whole roll of ribbon and unless you can use the remaining ribbon elsewhere you will have some waste. Lastly, comes the part I enjoy, which is picking a plush toy to adorn the top of the diaper cake. Again, the sky is the limit as far as choices so this shouldn’t be too big of a problem to find one that works for your design. Many styles also include baby care necessities such as baby shampoo, baby lotion, and powder. These items are optional based on your own design concept. After you get these supplies rounded up, all that remains is gathering up some common items many home crafters have around the house and you can get started. So far, I discussed the things you need to buy to make a baby diaper cake. Let’s talk about why people like to make their own diaper cake. Probably the main reason is to offer a personalized baby gift that is hand made. Usually, the person making a diaper cake knows the expectant mom very well and wants to create a special experience for the new mom. This person isn’t going to give a store bought baby gift as “anyone” can do that. Instead, they are creative and want to show that creativity through a thoughtful unique baby gift. Others may make a diaper cake to save money. I personally think, based on the emails I get, that many “do-it-yourselfers” underestimate the costs and time involved to make a diaper cake. How do I know? Because I get messages routinely asking about where to buy supplies, or how to attach items because their way isn’t working. So I can only surmise that they must be having problems making their diaper cake. Does this happen to everyone? No, and I am not trying to persuade anyone from making their own diaper cake, if that is their desire. I just believes, sometimes people underestimate what it takes to make a diaper cake that they can be proud to give as a baby gift. 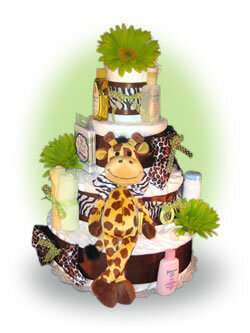 On the other hand, some choose to buy a handmade diaper cake directly from a company such as Lil’ Baby Cakes. There are many reasons for this with probably the key one being the buyer gets a professionally handmade diaper cake ready for baby gift giving. Instead of having to run around town looking for supplies and themes, one can merely go online and browse from pages of diaper cake designs looking for the right fit. The baby gift buyer only needs to pick an appropriate size and style, make the purchase, and then have it shipped to the new mom. It couldn’t be any easier. Who tends to buy diaper cakes online? Primarily I would say they are busy folks who don’t have the time or energy to create their own diaper cake. Another possibility is those who live away from the expectant mom and really need the convenience of being able to purchase a diaper cake that is already made. Companies may also choose to purchase a diaper cake online as it is a easy way to purchase a unique baby gift that the new mom would enjoy. Regardless of whether you make a diaper cake or purchase one for a baby shower, you definitely have choices. If you are the creative type, you many enjoy the process of researching a design and then moving forward to make your own diaper cake. I’m sure the new mom would really appreciate the thoughtfulness and the personalized nature of the baby gift. Similarly, if you are making a baby shower diaper cake, you and the other ladies planning the shower can work with each other to personalize the entire event and add your own special touches. Alternatively, for those who choose to purchase a diaper cake directly, you can choose from many popular styles and themes, all ready for gift giving. Either way, the expectant mom will receive a baby gift she is sure to love. A diaper cake is not only practical, but a baby gift that she’ll talk about long after the baby comes. What are your thoughts? I welcome your comments.